All Replies on Shark vs. DELTA 34-868 Bracket and Splitter Assembly got 34-450 Unisaw? Shark vs. DELTA 34-868 Bracket and Splitter Assembly got 34-450 Unisaw? If you have DC, then the Shark is hands down the best choice. I had one on my Unisaw, but I also had the Bies snap in splitter clamp to mount it in (now discontinued, I think). 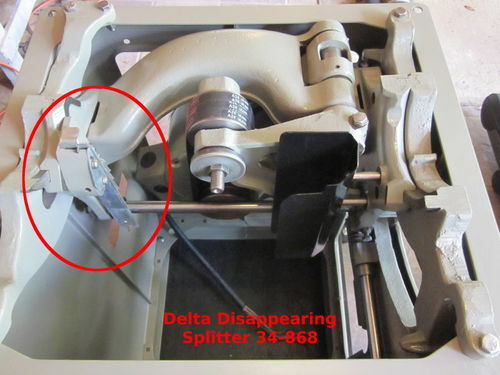 But if a splitter is all you want, the Shark splitter is very good…but that Delta looks like it will work just as well. Even without the DC hooked up, I would prefer to have the basket over the blade that the Shark offers (personally). Anyone tried the Delta 34-868 splitter? The only feedback I have found is Amazon reviews and I am reluctant to put faith there. I have one on my Unisaw, and I believe I have already highly recommended it to you. It stays on the machine and operates with a single finger. Here it is shown in the down position (table removed). Do you think that it is the better option for reducing the chance of kickback? Any negatives you have encountered? Well, a splitter is a splitter – even when it’s called a riving knife… and their purpose is to prevent kickback. Any one is certainly a better option than none at all. The disadvantage with stock splitters are they are usually a PITA to remove/install, so people typically just leave them off. The disadvantage with the MJ splitter is that it is fixed, and will not tilt with the blade. The Shark ARK and disappearing splitter will tilt with the blade, but need to be raised or lowered manually. The Shark requires you to loosen a thumbscrew to adjust the height. The disappearing splitter just pushes down or pops up with a finger. Both are left on the machine and do not need to be removed for non-through cuts. And no, I cannot think of any negatives I’ve encountered with the disappearing splitter. I sure like the dust collection feature of the Shark but with my current budget I think I am going to go with the Delta splitter.